In a middle week friendly, Portugal easily defeated Luxemboug by 5-0, in a game where Cristiano Ronaldo kept his scoring saga this pre-season. CR7 scored another goal from a freekick shot, still in the first half and got substitued by Nani at the halftime, probably to avoid risking any injury for the big game against Barcelona this weekend. The superiority from the "Lusitanos" got more evident in the 2nd half, showing Paulo Bento good signs to be confident for the next official match against Cyprus, in the 2nd of September. 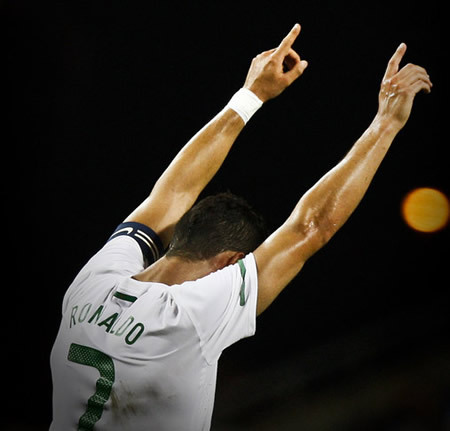 Portugal will have the opportunity to make a stand in the lead of Group H, in Euro 2012 Qualification stage. The Portuguese National Team coach used a 4-3-3 system, which was very dependent on the left-back (Real Madrid's Fábio Coentrão) and right-back (Sporting's João Pereira) physical availability to support attacking moves, as well as Cristiano Ronaldo mobility and ability to explore spaces. Close to the 25th minute of the first half, Cristiano Ronaldo sprinted to a loose ball, and Hélder Postiga was keen to score the first goal by making a great lob shot. Cristiano Ronaldo was probably aware that he wasn't going to play in the 2nd half, so he made an extra effort close to the halftime and still managed to make it 2-0 around the 43th minute, after taking a free-kick, close to the penalty area. The halftime then came and Paulo Bento rotated half the team, giving room for Nani, Hugo Almeida, Raúl Meireles, Ricardo Carvalho, Varela and Sílvio to participate in the match. Real Madrid player, Fábio Coentrão would still score the third goal, with just a couple minutes played in the 2nd half. The final score would be set by Besiktas player Hugo Almeida, with the Portuguese striker scoring 2 goals (58th and 72th minute), leaving no chance for Luxembourg to dream with a good result in the Algarve. Rui Patrício; João Pereira (Sílvio, 64'), Bruno Alves, Pepe (Ricardo Carvalho, 46') and Fábio Coentrão; André Santos, João Moutinho (Raúl Meireles, 46') and Rúben Micael; Danny (Silvestre Varela, 57'), Hélder Postiga (Hugo Almeida, 46') and Cristiano Ronaldo (Nani, 46'). Real Madrid first official match match this season will be against Barcelona this weekend. Next Sunday (14th of August), CR7 will play the first leg of the Spanish Supercup against Barcelona, in the Santiago Bernabeu. This will be the first of two games against Barça and Cristiano Ronaldo will most likely be in the line-up. You can watch Juventus live stream, the game Real Madrid vs Barcelona livestreams inside the Live Games Streams section. Countdown clock for the game is shown in the top right corner of this site.